I am constantly surprised that, despite the researches over more than a century by dozens of dedicated enthusiasts, 'new' names of previously unknown clockmakers come to light every week. One such to appear just recently was William Snashall of East Grinstead in Sussex, a most unusual surname and one I had never come across before. I thought at first the name was some sort of mis-spelling, but it proved to be correct. The name derives from the Old French word 'seneschal', which described a sort of steward who administered the estate staff and accounts in a large household. Presumably the office and word came across with William the Conqueror. The surname seems to have clustered around the counties of Kent and Sussex, perhaps where the Conqueror's footprint fell soonest and heaviest. The lantern clock pictured here is signed 'William Snashall of East Grimstead'. It appears to date from the 1650s or 1660s and was made with a balance wheel control. The fact that Grinstead is mis-spelled implies the engraving was not done locally, but at some distance and, as the style is close to that of the Lothbury district of London, we might suppose it was engraved there. Research found that William appeared in the local parish registers. He was born in 1626, the son of Robert and Jane Snashall of Slaugham, where he was baptised. He was a blacksmith, which trade seems to have been followed by several members of his family, probably including his father, as it was the kind of trade that passed down the generations. However none of his blacksmithing kinsmen are known to have made clocks and the clock pictured here is the only one so far recorded by William and the only clock to carry the Snashall name. The lantern clock is signed "William Snashall of East Grimstead" (sic). The alarmwork and alarm disc would have been removed when the clock was converted to long pendulum. He married a lady named Mercy, though the marriage record has not yet been located. The baptisms of several of their children appear at East Grinstead, but the registers are far from complete at this period. The children included Thomas born 1654, then 1655 William, 1659 Elizabeth, 1661 another William, 1663 Joan (or John). In one entry of 1658 William is described as a gentleman, but in another in 1666 as a blacksmith. One does not usually think of gentleman blacksmiths, but still .... perhaps a blacksmith from a genteel family? Three of his younger children died in infancy: an un-named child in 1658, five-year-old William in 1660, and a two-year-old son, again named William, in 1663. This was no doubt tragic for the family but infant mortality was generally very high at this time, so these deaths were no more than sadly normal. But in 1666 a very different series of deaths struck the household. On September 21st 1666 their twelve-year-old son, Thomas, was buried. On the 8th of October their seven-year-old daughter, Elizabeth followed. On the 14th of October William himself was buried having just turned the age of forty, followed on the 18th by an un-baptised daughter. This series of deaths in rapid succession were far from normal and are explained by a stark comment in the parish register alongside this last burial notice – explaining that the child was un-baptised on account of there "being plague in the house". What a terrible and most unexpected thing to happen. In 1666 the Great Fire of London destroyed much of London and the plague too, which had raged there since 1665, so we don't usually think of plague victims in 1666. But of course the fire had only just taken place on September the 2nd, so many who fled may have been taking the plague with them. Strangely this is the only instance in the entire parish registers of East Grinstead where the plague is mentioned. There were no other victims than in this one household, which was totally wiped out. How on earth could this one family have been infected? Is it possible William had been to London for clockmaking supplies? Surely the presence of the plague there was widely known and would have kept visitors away. The shield in the fret was intended for the owner's coat of arms or initials but was often left blank. Here it carries the initials of the first owners. The fret is of that pattern we call 'armorial', having a shield at its centre, which was presumably designed to carry the coat of arms of the first owner. A few clocks exist which do have a coat of arms, but the great majority have a blank shield. Some have monograms or initials, as here, where the shield carries engraved initials, which were presumably those of the first owners. Three initials, as here, normally signify husband and wife and are set out in exactly the same way as those carved over a house door or porch in that the centre initial stands for the surname. At this time I was often written for a J, and the presence of a crossbar through each I strengthens the likelihood that I S I meant J S J Such initials on a clock were usually to commemorate a marriage, though sometimes an anniversary, but not necessarily either. I searched the entire parish register of East Grinstead of marriages and baptisms to find any husband and wife each having a first name beginning with J (or I) and a surname beginning with S expecting to find several possibles. Amazingly I found only one! John Smith was married there on the 16th September 1661 to Joan Cornall. They were not local and had no children baptised there, so presumably came just for the marriage. 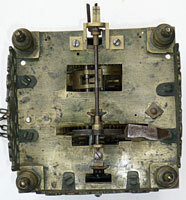 This right-hand view of the movement with the hammer on the right shows it was originally a balance wheel clock, converted later to anchor, as almost all were. Cornall is not a local name. In fact it is barely a surname at all other than a corruption of Cornwall. But Cornish IS very much a local surname and one Robert Cornish, who was born there in 1636 was trained up to be a blacksmith and clockmaker. He would have been apprenticed from about 1650 to 1657. No local records of that period are known to survive which would specify his master, but the only person at East Grinstead who is known to have made clocks at this early date was William Snashall. I would guess he trained under William Snashall. Robert Cornish married twice, firstly in 1656 to Jane Ansell. But Jane died in 1663, probably in childbirth, and he married for the second time in 1664, to a wife named Ann. They produced several daughters and one son, Richard, who was born in January 1666 and who himself went on to become a blacksmith and clockmaker there. That year of 1666 was when the outbreak of plague hit William Snashall's family and we can deduce that by then Robert Cornish had long left the Snashall household, in which he would have lived during his years of training. In fact Robert Cornish lived an amazingly long life till 1723, when he died at the age of 87, described in the parish registers as "an old man, poor". 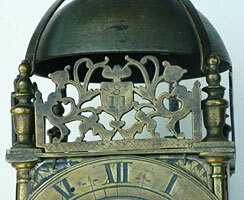 No clocks are recorded by the Cornishes, father and son, but they are known to have worked on local church clocks. So my guess is that the wife of the J S J partnership was Jane Cornish, the surname mis-transcribed in the parish registers, and that she was probably related to Robert Cornish. If so that might explain why they had William Snashall make them a lantern clock. All this is only conjecture but based on the known facts. The year 1661 would nicely suit the style of the clock. 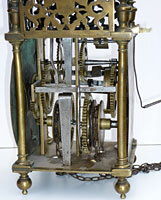 The movement from the top showing the empty holes where the balance escapement was once fitted and the later conversion to anchor escapement and long pendulum. The clock resembles those made in the Lothbury district of London at this time, this being the major centre of lantern clock making and this is almost certainly where William would have got his brass castings. But the hand, which is original to the clock, is very unlike a London hand, and perhaps indicates William's own design and craftsmanship. It is usually possible to assess the place of manufacture and estimate the age of a clock by its style, to within a few years anyway. In this instance we have one of those very few cases where we know the origins in regard to the place it was made, the maker and the tragic details of his life, the year of making and the people it was made for. That makes it an exceptionally unusual clock, as I doubt there is a handful of lantern clocks we could say that about.